'Print is dead'. That’s the story headlines have proclaimed for the last few years, and the evidence continues to pile up. This week alone saw the demise of Interview, the iconic pop culture magazine founded by Andy Warhol in the 60s, just hours after UK fashion weekly LOOK announced its closure. With online content taking over the role once owned by print media, the climate for magazines has never been more challenging. This is particularly pertinent for fashion publications, whose readers are increasingly turning to Instagram and blogs like The Blonde Salad and Man Repeller to get their sartorial fix. In response, mainstream media brands are either going digital-first – such as Glamour, which folded its print edition last October – or rebranding entirely. In this context, British Vogue makes an interesting case. The magazine is faring relatively well against competitors: year-on-year sales were down 4% as of February 2018, but this was a blip compared to the fall-off at Elle (-16%) and Marie Claire (-30%). Website traffic has also grown steadily since 2016, a year that saw the magazine’s widely feted centenary celebrations. At this time, Alexandra Shulman was hailed by publishers Condé Nast as the most successful editor in British Vogue’s history. So why did the magazine choose to pivot radically when appointing Shulman’s successor? Edward Enninful represents a big departure from the traditional Vogue stable. Black, gay and male, Enninful is expected to inject freshness back into the brand and adapt it for a more youthful, diverse audience. Diversity is becoming an increasingly important differentiator for brands. According to a 2017 KPMG study, Millennials are most likely to be socially progressive, and so promoting a more accessible and representative interpretation of fashion is important when creating appeal among these consumers. This is also sadly necessary if the magazine hopes to recoup some of the revenues lost from declining print sales – the average buyer of whom is aged 38 – and reach the 18-34 year olds advertisers are interested in targeting. The penetration of this audience is more significant on British Vogue’s website, at 61% of site visitors, making digital the key revenue driver. Indeed, capitalising on the magazine’s digital channels is vital, particularly as a huge 38% of its existing reader audience don’t consume any form of print media during a typical day, according to GlobalWebIndex data. By contrast, half visit Facebook at least daily and 46% are active on YouTube. Enninful has been in the job for eight months now, producing six editions of the magazine. How has he been received by online audiences? Enninful’s editorship had an immediate impact on positive sentiment for British Vogue. This surged with the publication of the December issue during November 2017, the first he edited. 36% of all social conversation around the magazine was positive in tone during the month, a significant jump from the monthly average of 16% prior to this. Positive discussion was driven by the issue’s theme, which celebrated multicultural British identity, as well as the savvy combination of celebrities appearing in its pages. Race is something Vogue has previously struggled to address, even leading to a skirmish on the magazine’s Twitter account in February 2017 when it failed to identify African American singer Justine Skye in a photo alongside other white models. More than a quarter of social conversation across the month called the magazine out on its mistake. As ever, the cover image remained a key talking point for #NewVogue. 11% of all mentions during November praised Adwoa Aboah’s appearance, which was only the fourth by a non-white model since 2002. 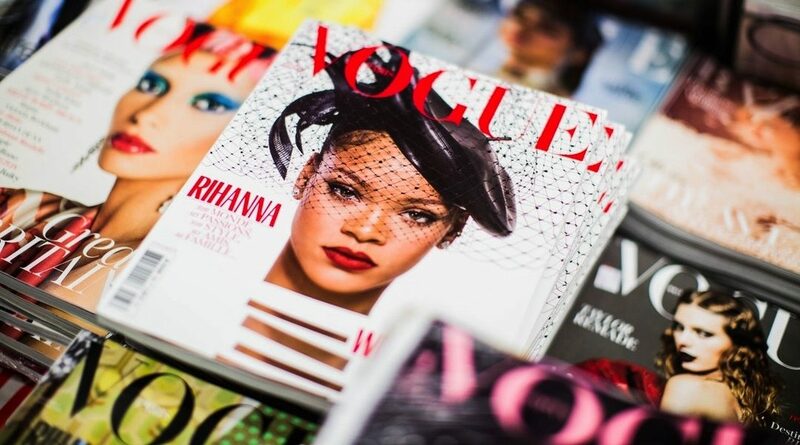 However, British Vogue made an even bigger splash in March after revealing its May cover featuring nine racially diverse models, including the first ever hijab-wearing model to appear on its front pages. 14% of all conversation during the month explicitly referenced the image, with the March 31st unveiling prompting a larger spike than even Enninful’s inaugural cover reveal. Overall, Enninful’s first six months on the job have been positive ones. 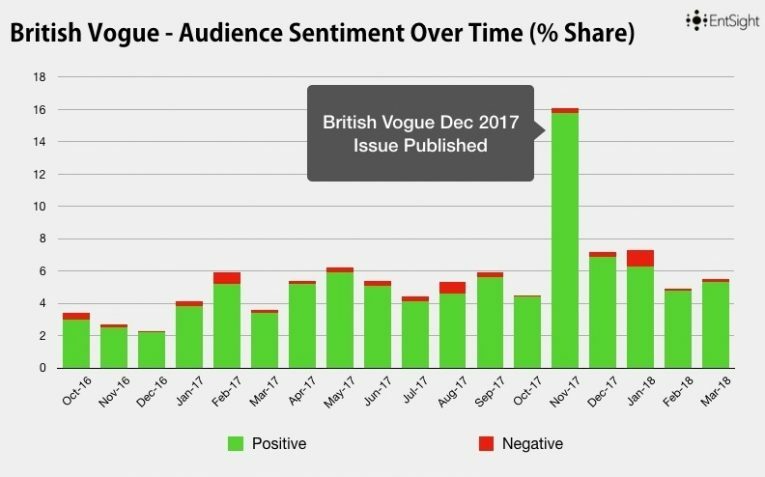 21% of conversation around British Vogue was favourable across the period, five percentage points more than during October 2016 – March 2017, a comparable period when Alexandra Shulman was still editing the magazine. Negative discussion also halved vs. Shulman’s tenure. A big concern about Enninful’s appointment among fashion insiders was how he would cover celebrities. A man with a thick black book of contacts, Enninful counts Naomi Campbell, Tilda Swinton and Rihanna (his “lil sis”, according to an Instagram post) as just a few of his close friends. As such, there’s a danger that the magazine could turn into an echo chamber of Enninful’s mates. Indeed, upon departing the magazine, ex-editor Alexandra Shulman speculated on the new generation of editors, who aren’t journalists but “celebrities or fashion personalities with substantial social media followings”. This was interpreted as a thinly-veiled swipe at Enninful. But for those worried that the involvement of celebrities – whether Enninful’s friends or not – overshadows commentary on more worthy topics, they may have a point. The impact of Adwoa Aboah’s cover in November was dwarfed by people commenting on or sharing content by celebrities featured in the issue. Zayn Malik’s ‘love letter’ to Bradford was referenced in 12% of all mentions around the November edition, while an interview with Stranger Things actress Millie Bobbie Brown drove 15% of mentions. Similarly, 5% of all content during Enninful’s inaugural six months originated from Taylor Swift fans following her January cover. A tweet by the singer was shared more than 19K times. Another significant shift between the two editors has been the types of fashion brands associated with British Vogue. Of the four segments (High Street fashion, Luxury, Mid-Market and Sportswear), Luxury made up 80% of the conversation share during Enninful’s first six months, 17 percentage points more than during a representative period when Shulman edited the magazine. Gucci benefitted most from this increased focus. It accounted for 37% of Luxury mentions under Enninful, thanks to coverage of its swimwear and Harry Styles’ appointment as the brand’s new face. Versace and Dior followed due to shares of more cerebral content on the future of the industry. This focus on Luxury has been at the expense of Mid-Market brands, whose share of conversation shrank from 25% to just 6% under Enninful. Tommy Hilfiger, for example, dominated the Mid-Market landscape during Shulman’s tenure after running ads for its Tommy x Gigi collaboration in the magazine. Coverage declined 88% after November 2017, although Calvin Klein took up some of the slack. Enninful’s Vogue has also sought to collaborate more with sportswear brands. Mentions of these in connection with the magazine grew nearly threefold, boosted by an on-message piece showcasing Nike’s new collection on 10 inspiring young women. This is the kind of brand content we could see more of as Enninful settles into his role. It’s still early days for Enninful – Alexandra Shulman was British Vogue’s editor for 25 years, after all – but the first six months of his editorship illustrate that he really is committed to increasing representation in fashion, and people are taking notice. 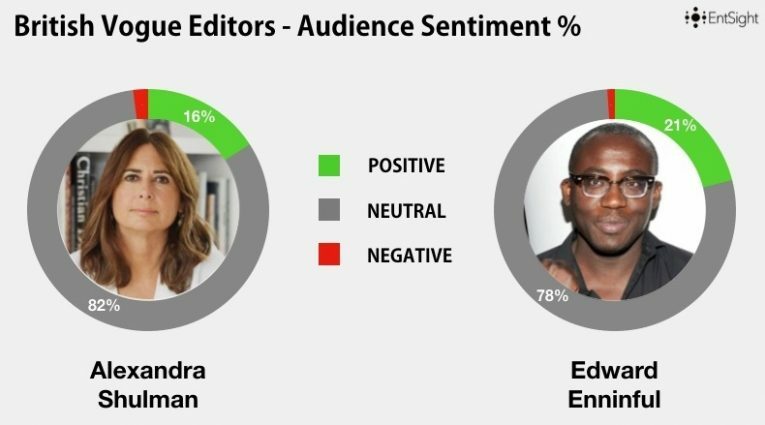 There was 60% more conversation around Enninful’s period at the magazine compared to Shulman’s. However, only sales figures (released in another six months) will really reveal whether this progressive new direction comes with pound signs attached.